Gov. 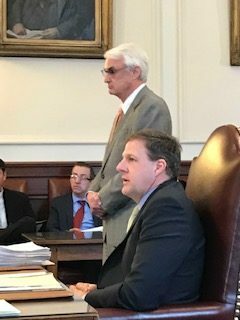 Sununu and HHS Commissioner Jeffrey Meyers at Wednesday's Executive Council meeting. CONCORD — If the federal government shutdown continues, state food programs could be at risk as soon as March, Executive Councilors were told Wednesday, but the more immediate concern is federal employees required to work without pay. At Wednesday’s Executive Council meeting, District 5 Executive Councilor Debora Pignatelli, D-Nashua, asked what the state is doing to help its federal employees who are out of work or forced to work without pay because of the shutdown. “We ought to do something as a state,” she said, and suggested the council, along with the governor, could formally urge the Legislature to act quickly to help federal workers. Lawmakers are preparing several pieces of legislation hoping to act quickly to address the problems faced by federal workers who will be without their second paycheck Friday. But the legislation could clash with US Department of Labor guidelines. Gov. Chris Sununu said he is willing to look at anything lawmakers decide to do, as long as it is fiscally prudent and does not jeopardize other federally funded programs. The federal government recently warned states that federal employees who work without pay are not eligible for unemployment benefits. If states do provide unemployment benefits, the US Labor Department said it will not reimburse the states and those states would be out of compliance with federal statutes and rules that could jeopardize other programs. Some states are defying the federal guidance not to compensate federal employees who are forced to work without pay including California, Vermont and Colorado. State Department of Employment Security Commissioner George Copadis told the council he had a conference call with other states’ commissioners that afternoon. He noted about 1,600 of the state’s 2,400 federal employees are working without pay. Federal workers who are laid off and not working or furloughed are eligible for unemployment from the state, but those who are working without pay are not. Copadis said being out of compliance with federal law and rules would also impact what the state’s businesses have to pay for federal unemployment insurance. The businesses would have to pay about $20 million more because they would lose their current discount, he noted. Several councilors asked Copadis if the state received similar directives from the federal government in past shutdowns. Copadis said the state was given the same guidance during the 2013 federal shutdown over funding the Affordable Care Act. He said in 2013 the US House and Senate passed legislation to pay all federal workers for their missed pay as they are planning now. Pressed if he thought government should be shut down because of a political agenda, Sununu said he hoped that would not happen. “Shutting down government to achieve an individual political agenda is a terrible idea,” Sununu said. 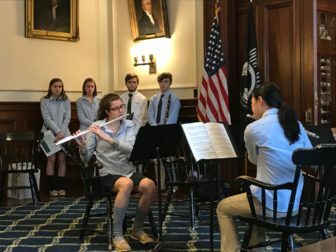 Members of Bishop Guertin High School Honors Band entertain prior to the Executive Council meeting Wednesday at the State House. At the council meeting, Health and Human Services Commissioner Jeffrey Meyers told councilors the greatest risk for the state if the federal shutdown continues are food programs through the US Department of Agriculture such as foods stamps, school lunch programs and the Women, Infants and Children Food Service (WIC). Those programs are funded through February but are concerning for March, Meyers said. Housing and Urban Development funds are a problem for some states, he noted, with some landlords’ contracts cancelled, but not yet in New Hampshire. District 3 Executive Councilor Andru Volinsky, D-Concord, said he has heard some Small Business Administration loans are not being processed. State officials said other financial programs have similar problems. State officials also said they are tracking state employees whose positions are between 75 and 100 percent federally funded. Meyers said most of the federal money the state receives to fight the opioid crisis have already been approved. After listening to the discussion, District 1 Executive Councilor Michael Cryans, D-Hanover, asked Meyers, “So our most vulnerable will be the most affected?” And Meyers replied the federal food programs are most at risk. 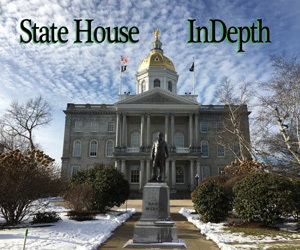 Pignatelli urged other councilors to join her in a letter to the Senate President and House Speaker urging them to act on their proposals to help New Hampshire federal workers as quickly as possible. She was joined by Cryans and Volinsky, but not District 3 Executive Councilor Russell Prescott, R-Kingston, nor District 4 Executive Councilor Ted Gatsas, R-Manchester, who both said they wanted to see the proposed legislation before committing. After routinely approving step increases for many of the state high-level managers such as commissioners, deputy commissioners and division heads, Volinsky was concerned about increasing the pay of four high-level Liquor Commission managers, including Commissioner Joseph Mollica and Deputy Commissioner Michael Milligan. Volinsky noted the commission has repeatedly produced less revenue than projected and said for an agency that claims to be run more like a business, he could not see rewarding the top management with raises. Volinsky and the commission have clashed over the cash sales of large quantities of liquor to out-of-state buyers. But Cryans said he wants to hear from Mollica before deciding on the increases included in the latest bargaining agreement with unionized state workers. He said they should hear his side of the story. The council voted 4-1 to table the requests until its next meeting when Mollica could be present. Gatsas was the No vote to table the request.